After bursting onto the scene with 2003's debut Vault (which won "Drum'n'Bass Tune Of The Year"), Pendulum have since gone onto take the titles of "Best Breakthrough Producers", "Best Producers", and again "Tune Of The Year" in 2004 with the mighty Another Planet – an anthem of epic proportions. 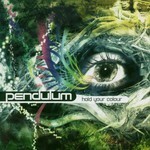 Pendulum's eagerly anticipated debut album Hold Your Colour features thirteen groundbreaking tracks that blend heavy electronic funk, never-before-heard innovative sounds and 'real' musical elements to produce a superb first offering, destined to break down genres and mangle charts worldwide. Hold Your Colour is a triumph for Australian drum'n'bass. This unstoppable collective have recently been labelled by both mainstream press and radio alike as "the one's to watch in 2005". The album includes collaborations with the mighty Feestylers, chart topping MC Spyda and the award winning DJ Fresh to name a few. Straight from the huge cinematic introduction, the album takes you on an action packed ride from anthems to emotional journeys and everything in between. From furious dancefloors bombs Slam, Hold Your Colour and the massive Tarantula featuring the vocal talents of MC Spyda and Tenor Fly, to smooth soulful rollouts Plasticworld and Streamline. From breakbeat monsters Fasten Your Seatbelts and Out Here, to the latin-rock electro fuelled funk of Girl In The Fire – this long player takes listeners on a trip through genre bending territory. Bonus tunes, Another Planet and Still Grey finish the disc. Another Planet hit number 1 on the UK dance chart last year, and Still Grey is still a fantastic piece of liquid dancefloor action. The Pendulum story thus far can only be described as one of much warranted overnight success, and their debut album holds all the promise of becoming a dance classic. One of the most ambitious drum'n'Bass albums in history Hold Your Colour shows how far you can take drum'n'bass and makes the sound accessible for a whole new section of music lovers. Striking a chord between underground credibility and commercial success, Pendulum have put together an LP that works in the club and on the home stereo. Hold Your Colour is definitely a step forward for Australian drum'n'bass, and one of the best albums to come out of the Australian dance scene in general. Besides, Pendulum's willingness to flex their production muscle outside of their traditional drum'n'bass sphere is admirable, and Hold Your Colour sees them almost pull it off.